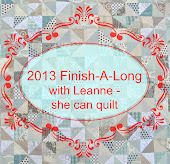 This year, I’m going to be participating in the 2013 Finish-A-Long. It looks like a lot of fun, and like a great way to get me to finish some of these projects that have been sitting around forever. 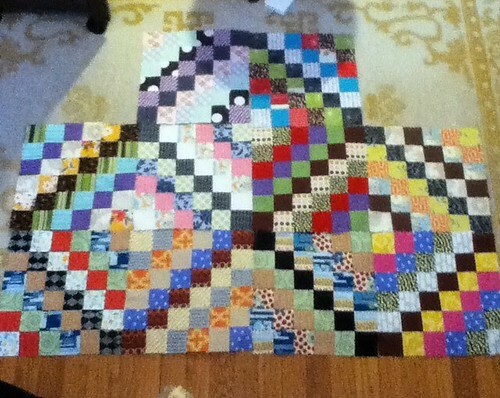 1) I’m going to finish the Scrappy Trip quilt top. This is a pretty big goal for me, while the semester is going on, especially since it’s going to be a queen-sized quilt, but I’m going to go for it. It makes for really good mindless-sewing, so perhaps I’ll have some luck working on it. 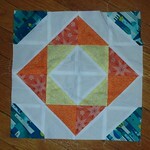 2) I’m going to finish my New Wave quilt. It’s all cut — all I have to do is pick the order of the fabrics, piece it, and quilt it. All. Hah. I’m actually pinning the fabrics up next to each other for this one, and I’ll be posting about that soonish. Finishing this up is a bit of a bigger task than it sounds, because I’m doing 2 blocks for each month, which makes for a twin-sized-or-bigger quilt, not a lap quilt. The main question will be figuring out the sashing, backing and binding fabrics. 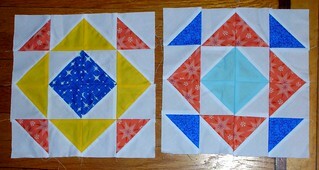 4) I want to make a Pinwheels and Postage Stamps quilt using two charm packs and two mini charm packs of Simply Color. I think it will look LOVELY. And I’m not sure how big it will end up being — that’ll depend on how much I can eke out of the fabric I have. 5) I’m going to make a handful of little change purses with keychain rings as gifts for friends using this tutorial on Noodlehead. 6) I’m going to make a trio of fabric baskets to hold my 2 1/2″x2 1/2″ fabric squares and my leaders and enders. The main question for this is picking the fabrics! 7) I’m going to make a weighted pincushion organizer for my sewing table, because it would be nice to have somewhere to put thread scraps without bending over to figure out where I’ve put the garbage can, and I actually don’t have a pincushion right now. And, honestly, that’s more than enough for me to have on my plate for the spring semester, with all the coursework I have in store! Next Next post: Organization! It’s a wonderful, if short-lived thing.